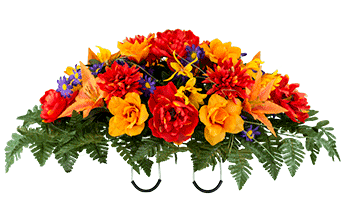 Silk Floral Saddle arrangements are available in many standard and seasonal combinations, allowing them to be rotated during the course of the year. All of our saddles come standard with adjustable “gripper” feet meant to withstand even the strongest wind gusts. 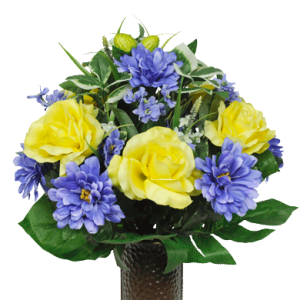 Silk Floral Bouquets are also available in many standard and seasonal combinations. These bouquets are ideal for use in any of our Granite Vases and are a perfect complement to many of our Silk Flower Saddles. Stop in to choose from our stock selections or special order bouquets.